Fortunately, there are a few free or nominally priced soil enhancers. You probably have a few around your yard or kitchen. Perhaps you are already adding them to your compost pile. That's a great use for these materials, too. However, you can cut out that middle step and add them right to your garden soil for even quicker benefits. Whatever you do, don't throw them away. Let's take a look at what each does for your garden. 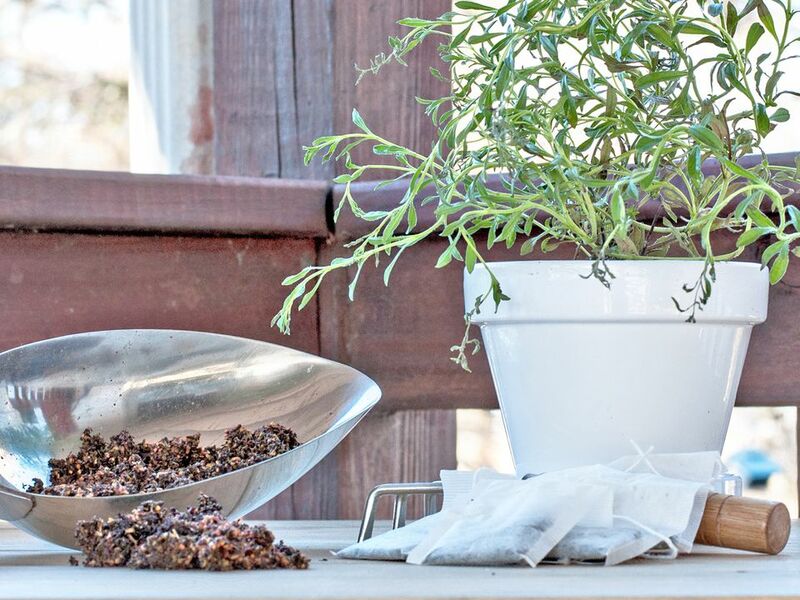 There are many ways to use coffee grounds in the garden. They can be used as mulch, they add a bit of nitrogen to the soil, they seem to attract worms, and can even deter slugs, although studies are ongoing about whether it is the abrasiveness of the grounds or the caffeine that does in the slugs. Don't worry about the acidity of coffee affecting the soil's pH. Studies have shown that as the coffee decomposes, the pH neutralizes. A bigger concern is what happens when you apply a very thick layer of coffee on top of the soil, about 2 inches or more. As the coffee dries, it forms a crusty shell that does not allow water to pass through. Use your coffee grounds sparingly. Put the excess in the compost. And don't forget about those paper coffee filters. They can often be composted, too. Sprinkle your used tea leaves around the base of acid-loving plants, including your tomatoes and roses. We've always known coffee grounds were good for plants, but tea leaves contain all the big three nutrients (NPK) as well as some trace minerals. Sprinkle the used leaves on the soil and gently scratch them in. Of course, you can also add tea leaves to your compost pile. Another clever way to make use of used tea bags is using them to cover the drainage holes in containers. They hold the soil in while allowing the excess water to drain. Some of the nutrients will wash out with the water, but you could still get a bit of that benefit in the container soil, too. Fresh grass clippings are a mixed blessing in the garden. They are very high in nitrogen (about 10 percent), which makes them a green or "hot" addition to the compost pile. Mix them with about 3 times as much brown material, like dry leaves, and you'll have crumbly compost in weeks. However, if you try to pile grass clippings alone, you will have a sticky, matted mess with a foul order. You can also use grass clippings as a mulch. Some gardeners do not find grass clipping mulch attractive, but they are great in the vegetable garden. This way the nitrogen and potassium from the blades will go right into the soil. However, the same caution applies. Too thick a layer of grass clippings will become a slimy, unpleasant mat. Instead of dumping them on the soil, let them dry for a day or two and then sprinkle a thin layer around your plants, just covering the soil. Repeat this process and you will eventually have a layer of protective mulch that slowly decomposes as you top it off with fresh clippings. Pine needles, or pine straw as it is sometimes called, doesn't add much in the way of nutrients, but it is still a great form of organic matter and it can work wonders for loosening up heavy soils. The older needles naturally drop from evergreen trees in the fall. Since they are already dry, you can simply rake them up and spread them around your plants and garden beds. They won't mat and decompose the way grass clippings do. If you are worried about pine needles raising the pH level, rest assured that the effect is minimal and, as with coffee grounds, temporary. You could always use them around acid loving plants, like azaleas and blueberries. Straw makes a wonderful mulch. It's easy to put down, lightweight, spiders love to live in it, water passes through it, and it's easy to move aside when you need to plant. It is also unattractive, which makes it a better choice for the vegetable garden than a flower bed. While straw is relatively inexpensive to purchase, you can sometimes get the straw bedding cleaned out of horse and livestock stalls for free, if you have the means to trek it home. Straw bedding will come with some manure and urine mixed in, so you don't want to add it to your garden until it's had a few months to compost. So set up a pile near your compost, away from open windows where the scent might blow in, and keep replenishing your supply. Manure has been used to amend soil for centuries. While it does add both nutrients and organic matter to the soil, it can also come with ammonia that can burn plants, and pathogens such as e. Coli. If the animal was a plant eater, it can also come with viable weed seeds. You have to use manure with care. Allow fresh manure to compost and cool for several months before adding it to the garden. Top dressing the soil in the fall is a good way to take advantage of manure's soil conditioning without having to worry about contamination. We all have plenty of newspaper and cardboard piling up. Rather than taking it to recycling, use it as a base under organic mulches. Both are wonderful at suppressing weeds and holding in moisture. You could even spread a thick layer of newspaper or a sheet of cardboard over existing grass and then cover with soil, to create an instant planting bed. If you have access to a chipper, you can create mulch from all the branches you prune in the spring. Even if you can't do your own chipping, check with your town landfill. More and more of these facilities are creating compost and chipping piles that they offer to anyone who can cart them away. Be wary of the compost unless you know what has gone into it. It could include weed killer and other chemicals you don't want on your plants. However, the chipped wood is usually safe to use. It's worth asking about! Take a look around at other seeming waste products, like wood ash and sawdust. If they are organic based and have not been exposed to chemicals, they are probably good for your soil.